It's okay, we don't judge. We're actually really glad you stuck with it and got the credit. Good for you! Now that you're off to college you'll need to transfer your Concurrent Enrollment credits to the university of your choice. Please allow 3-5 business days otherwise. Picture ID is required to obtain a transcript in person. For fastest and easiest ordering, please use your student portal! 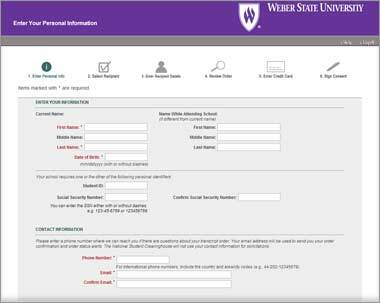 For fastest and easiest ordering, please use your online WSU student portal! You can order a copy of your transcript through the "Official Transcript" app link. Find it fast by typing "transcript" in your portal's search field. *Please note you will need your Social Security Number to complete the request form. If your record has been encumbered by financial indebtedness to the University until the encumbrance has been cleared. If your record has a financial hold, you must have the hold removed in order to request or obtain a transcript. If a friend or relative is picking up or mailing your transcript for you, they must bring a letter releasing your transcript with your signature on it. Due to Federal privacy regulations, the Records Office is required to have your signature accompany every Official Transcript request.